For Kennedy and the rest of the Bearcats, there is no other option but winning at this point in the season. Some things never get old – Maddie Zylstra elegantly lofting three-pointers from behind the arc, Nikki Wheatley slicing her way through traffic and laying up basket after basket, Brianna Kennedy patrolling the paint like a traffic cop and swatting away shot after shot, Taylor Anderson directing traffic and popping her patented jumper, and Jaclyn Smith playing stingy defense and unselfishly passing the ball to set up her teammates. All those talents and more were on display as Bonita defeated highly-rated Bellarmine-Jefferson, 67-52, putting on a 25-to-9 sprint to end the game after slipping behind 43-42 late in the third quarter. The Bonita home crowd and Bonita coach were highly impressed. That they did, especially after the Bell-Jeff Guards, down at one point, 40-27, in the third quarter, poked in front, 43-42, on a go-ahead basket by its standout point guard, Rishonda Napier. That nerve-racking moment didn’t last long fortunately as Kennedy’s put-back gave Bonita back the lead, 44-43. Still, at the end of the third quarter, Bonita was clinging to 49-43 six-point lead. “I just said we have to be disciplined and do our thing,” Baumunk said on ending the third period and entering the fourth. “I yelled a little bit because we started giving in. I said you have to listen to what we’re telling you, and we did in the fourth quarter. Although Bell-Jeff brought an extremely athletic squad to Bonita, it was Bonita that turned the fourth into their own personal track meet. In what seemed like a matter of seconds Kennedy and Wheatley – Ms. Inside and Ms. Outside – pushed Bonita’s lead to 59-47, then Zylstra and Anderson started dealing and delivering as well. In the end, it was just too much Bonita firepower. Zlystra finished with a team-high 22 points, followed by Wheatley with 19, Kennedy with 18 and Taylor with 8. 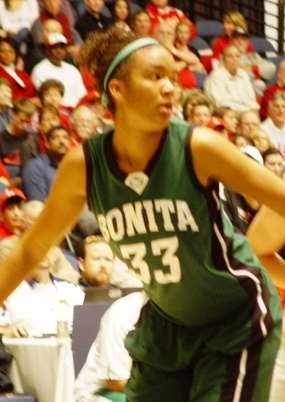 Zlystra helped take away the game’s early jitters for Bonita connecting on a three-pointer to start the game. She closed with a bookend trey to end the first half as well, helping the Bearcats take a 33-24 lead into the locker room. With the Bearcats rolling once again – perhaps playing their finest game on Thursday – last week’s loss against Orange Lutheran for the CIF title seems another generation ago. With the win, Bonita finished the season undefeated at home. Even Kennedy, a tower of power all season, is soaring to another dimension. “Coach told me to step up, we can’t win this without you,” Kennedy said. 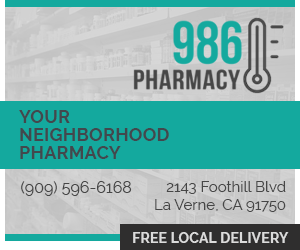 Hey, Girls, Bonita Parents: Get used to using the COUPON button located on the LVO Home Page. Great money-saving coupons. For all your real estate needs, call Colleen Bennett at (909) 374-4744. I’ll personally vouch for her!